In the 1994 film, “The Shawshank Redemption,” a convicted murder in prison comes across a recording of Mozart’s “The Marriage of Figaro,” locks himself into the warden’s office, and plays the Letter Duet over the prison’s public address system. Actor Morgan Freeman, who narrates the film, declares his fellow inmates had no idea what the two Italian ladies were singing about. It’s doubtful that the audience for the opening of Grand Rapids Symphony’s D&W Fresh Market Picnic Pops felt the same. But it’s likely they enjoyed the experience just the same. On a mild, mid-summer's evening, the 22nd annual Picnic Pops opened Thursday, July 14, with “Classical Fireworks,” favorite classical works of music, capped by a pyrotechnic display over the hills of Cannonsburg Ski Area. If you missed it, the Grand Rapids Pops opener, including the fireworks, repeats on Friday, July 15. Ticket information is available on the Grand Rapids Symphony's website. Principal Pops Conductor Bob Bernhardt was on the podium for his second season at Cannonsburg Ski Area. Guest soprano Mela Dailey and Grand Rapids soprano Diane Penning were special guests. So were some 2,400 people in the audience, some of whom arrived hours before the downbeat to be sure to get a good seat. Neither Robert De Niro, Eddie Murphy nor Cher were on stage, but music from “Raging Bull,” “Trading Places” and “Moonstruck” were part of the show. So was music such as ** and ** commercials for Godiva Chocolate and several varieties of yogurt. 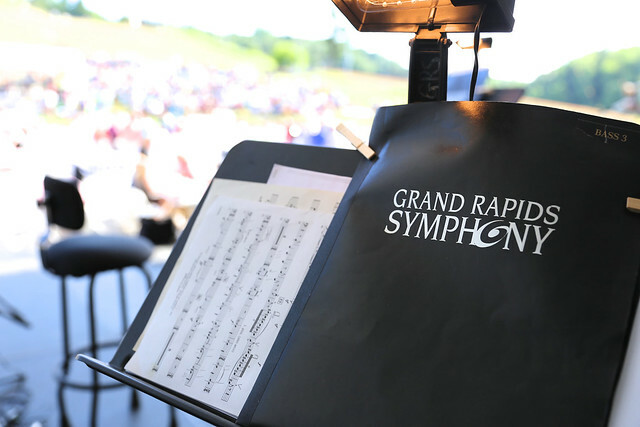 The Grand Rapids Symphony deftly handled a wide variety of music from the 18th century classical era, the 19th century romantic era, plus contemporary film music. More than a lesser orchestra could do in one setting. Music such as Richard Wagner’s “Ride of Valkyries” packed a wallop while Johann Strauss Jr.’s “On the Beautiful Blue Danube” tripped along elegantly. Music such as Giacomo Rossini’s Overture to “The Barber of Seville” was delightful while “Adventures on Earth” from John Williams’s 1982 score to “ET: The Extra Terrestrial” was dazzling. The second movement from Beethoven’s Symphony No. 7, heard in such films as “The King’s Speech,” as King George VI, born with a stutter, gives an important radio address, bloomed and blossomed. The Grammy Award winner, who made her Grand Rapids Symphony debut at last December’s Holiday Pops, returned to West Michigan to sing showstoppers from several Puccini operas. Penning, a frequent guest artist with the Grand Rapids Symphony, joined Dailey for duets including the exquisite “Flower Duet” from Léo Delibes’ “Lakmé.’ It’s a production few opera companies produce, so even fewer opera lovers have heard it in context. But it’s a magical duet nonetheless. The 2016 D&W Fresh Market Picnic Pops opener repeats tonight. But if you miss it, the Grand Rapids Symphony in DeVos Performance Hall will screen the entire, full-length films, “ET: The Extra Terrestrial,” in November; and “Harry Potter and the Sorcerer’s Stone,” in January 2017. You won’t want to miss those.